Thanksgiving is one of America’s favorite holidays. It’s filled with family, food, and festivities — what’s not to love? But there are more benefits to Thanksgiving than curling up by the fire and enjoying pumpkin pie. The time we spend reflecting on our gratitude can have positive impacts on our mental and physical health. Fortunately, unlike some of the other Thanksgiving fun, we don’t have to limit this impact to one day of the year. In this post, we’ll look at the benefits of gratitude and how you can cultivate it every day. Thankfulness can positively impact every area of our lives, from our health to our relationships. Scientists and psychologists who focus on researching the effects of gratitude have discovered surprising benefits that can dramatically increase the quality of life. Expressing gratitude to yourself and others affects the body’s biochemistry, which directly affects how we feel. Thankfulness increases positive emotions and decreases negative emotions. Robert A. Emmons, professor of psychology at UC Davis and a leading scientific expert on the science of gratitude, discovered that gratitude is related to 23% lower levels of stress hormones. He also found that counting blessings and writing letters of gratitude reduced the risk of depression in at-risk patients by 41% over a six-month period. Practicing gratitude led to a 7% reduction in biomarkers of inflammation in patients with congestive heart failure. Grateful people were shown to have a 16% lower diastolic blood pressure and 10% lower systolic blood pressure. Grateful people were shown to have between 9-13% lower levels of hemoglobin A1c, a key marker of diabetes. Gratitude has been related to a 10% improvement in sleep quality in patients with chronic pain, 76% of whom had insomnia. Gratitude and other positive emotions were shown to provide pain relief by stimulating the release of endogenous opioids. If you need to improve your self-esteem, just keep a gratitude journal. A 2014 study published in the Journal of Applied Sport Psychology found that gratitude increased athletes’ self-esteem, which led to performance enhancement. But that self-esteem doesn’t limit empathy. According to a 2012 study by the University of Kentucky, grateful people are more likely to behave more sociably, even when others are unkind. Study participants who ranked higher on gratitude scales experienced more sensitivity and empathy toward other people and a decreased desire to seek revenge. Life doesn’t have to be a bed of roses for you to be thankful. Gratitude in the face of difficulty actually increases resilience. Multiple research studies have shown that gratitude plays a major role in overcoming trauma. 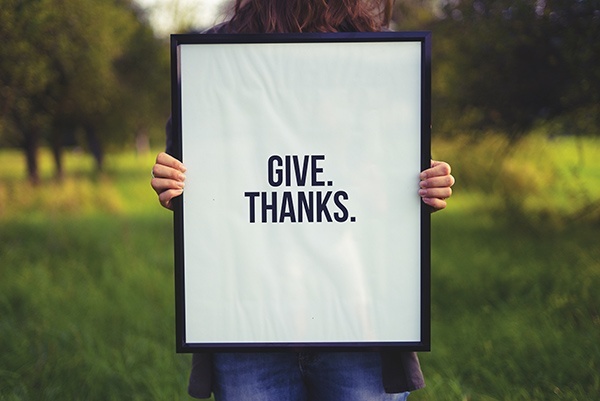 A study published in the Journal of Personality and Social Psychology in 2003 found that gratitude was a significant contributor to resilience following the terrorist attacks on September 11. And a study published in Behavior Research and Therapy in 2006 found that Vietnam War veterans that expressed gratitude experienced lower rates of post-traumatic stress disorder. Everyone wants to be appreciated, so it’s no surprise that thankfulness impacts relationships in a positive manner. A study published in Emotion in 2014 found that thanking a new acquaintance makes them more likely to seek an ongoing relationship. Psychology professors at the Keck School of Medicine at USC, shared recently in Psychology Today that gratitude is beneficial to relationships because it demonstrates care, expresses that the people in the relationship want to be involved with each other, and encourages those in the relationship to willingly increase their support of one another. So how can you be more thankful? Even for the most optimistic of people, gratitude can can be difficult to come by — especially in trying times. Here are five ideas that have been proven to grow your gratitude. Gratitude researcher, writer, and speaker Shawn Achor shared recently on the 10% Happier podcast the power of keeping a detailed gratitude journal. He advises writing down three things you're grateful for that occurred during the day and recording the details about the experiences. If you make this exercise a habit, over time your brain will begin to continually scan for the positive in your life. Achor also recommended creating a thankfulness jar. Write down things and experiences you’re thankful for on small pieces of paper and add them to the jar. When you’re feeling down, or when a stressful event occurs, reading the notes or even simply seeing the jar can serve as a positive reminder of all the good things in your life to lift your spirits. If you’re thankful for someone, tell them! Sharing your gratitude will grow the relationship, and will remind you of how lucky you are to have the person in your life. Short thank-you notes in the form of handwritten cards, emails, or text messages will all be appreciated by your recipients, increasing the gratitude! Thankfulness in the midst of a hectic day can be challenging. Rather than waiting until you’re with your journal or gratitude jar, simply make a mental note of what you’re grateful for as you go through your day. If you pray, say a prayer of thanks. If you meditate, do a gratitude meditation. Sometimes we’re so busy that we fail to appreciate what we’ve been given. Boost your thankfulness for the little things by trying sensory gratitude. Next time you enjoy a cup of coffee, take a walk, or experience some other simple pleasure, pay attention to how it feels, tastes, smells, sounds, and looks. Immerse yourself in the experience, find words to describe your senses, and give thanks. This Thanksgiving season, experiment with growing gratitude and watch the effects it has in your life. Then, make gratitude a habit every day of the year!